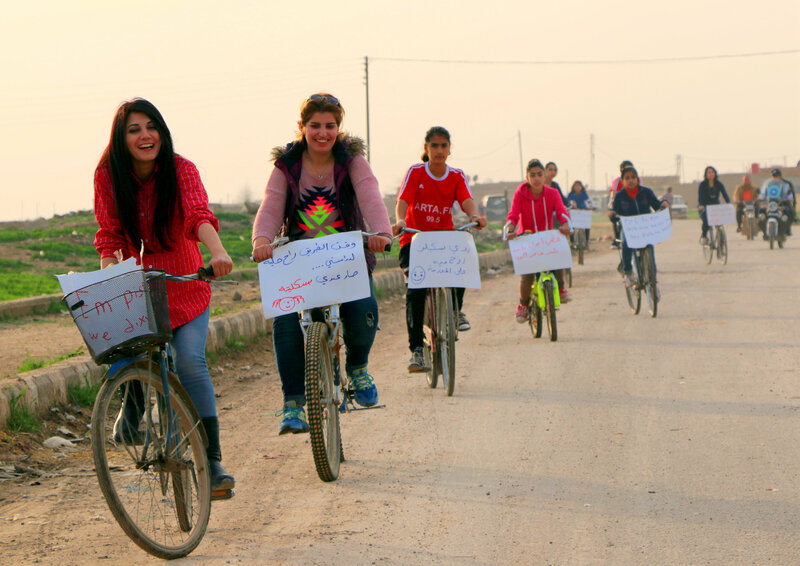 Last March, 10 girls started a campaign to enable women in the northern town of Amude, Syria, to use cycling for transportation and to send a message to their community that they are equal to men in all the aspects. It’s ironic to see women not being allowed to cycle by the same men who proclaim equality between men and women when fighting ISIS or any other enemy. Moreover, the new family registration book that was released recently in the same region of Hasaka province prohibits men from getting married to more than one wife, unlike the law in most countries with a Muslim majority. If the law in Hasaka dictates that men and women should have the same rights and freedom, why not allow them to cycle? The cycling campaign was Aria Al Omari’s idea, a woman who lives in Amude, to send a message to the community to break all the old fashioned rules controlling women’s lives and behaviours. Aria told Arta FM that now is the right time to start the initiative so that the community gradually gets used to seeing women cycling and considers it a normal thing to do. Aria added that she did not expect to see 10 girls starting this initiative as nobody had really prepared for it, and that all the girls seemed to want to do it but each of them was waiting for her friend to start. Another participant, Abeer Shakir, with her funky style, said that she was hoping to make cycling the mode of transport that everyone would use from now on, to go to school, stadium, college and anywhere else. Some of the girls in the region are allowed to cycle and jog until they reach a certain age when they will be considered grown up girls and would be looked at by their community in a disgraceful way if they keep cycling or running around. Salwa, another participant, cycled a lot when she was a child. As she got older she had the support of her father but not her community, and as she did not see any girl of her age cycling in Amuda she stopped cycling. Salwa saw the cycling campaign as a golden opportunity to get back on track so she joined in full of spirit and excitement. The reaction among the Kurdish male society to the campaign was mainly positive and many thumbs were up, and regardless of those few negative reactions, this campaign will inspire more initiatives to bring a better future for Kurdish women in Rojava, ensuring they are equal to men on more than just the front lines. Posted in CRITICISM, CULTURE and tagged #KurdishWomen, #WomenRights #Criticism. Bookmark the permalink. The Kurdish Cultural Festival was in Town Again!